Treat your family to an unforgettable experience ~ the exciting Moonlight Hike at Red Rock State Park. This adventure includes a naturalist-led interpretive hike on the park’s beautiful trails. Take in the views when the sunsets and the moon-rises. 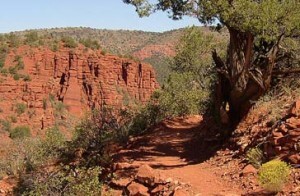 The hike lasts for approximately 2 to 2-2½ hours, has an elevation climb of 200-250 feet and covers 2 miles. Dress comfortably, wear appropriate hiking shoes, and bring water, a flashlight and insect spray. The Park recommends you come through the gate about 30 minutes before the hike begins. (No late arrivals will be allowed). Please call (928) 282-6907 for starting time and reservations (required). A $5.00 per person program fee will be charged at the time of the reservation. There is also a $10.00 entrance fee to the Park for a car of four adults. El Portal Sedona Hotel has some great Sedona hotel packages, so you can check in at the hotel, relax in our beautiful courtyard, grab a bite to eat, and then head off for your moonlight hike! El Portal is a boutique hotel, where luxury abounds. All of us at El Portal are dedicated to making your Sedona Arizona vacation a memorable experience so ask us anything & we’ll do all we can to help. 1-800-313-0017.